Grace and Peace Quilting: 1,200 1 1/2" Squares! 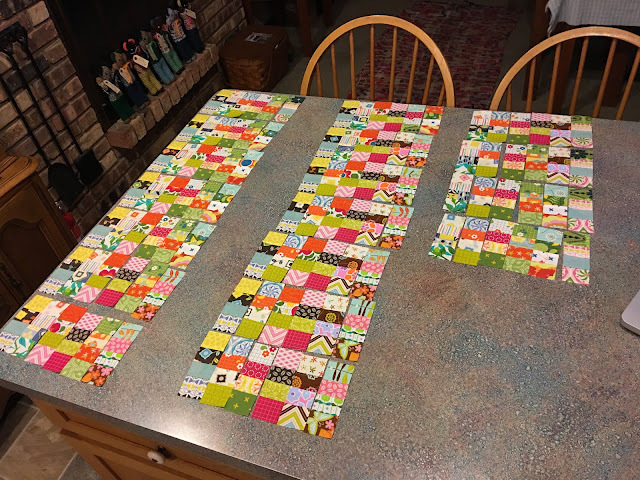 What does a quilter do with 1,200 1 1/2" squares?? There are probably as many answers to this question as there are quilters out there! I'm making 50 needlecases for Operation Christmas Child shoeboxes. Here are a few of them being arranged and rearranged for sewing. 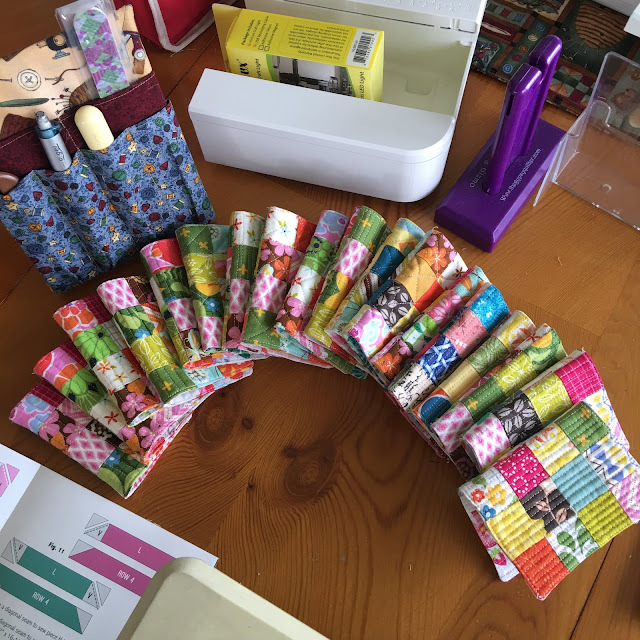 I was at a quilt retreat over the weekend and got a few more put together. Eighteen finished so far! 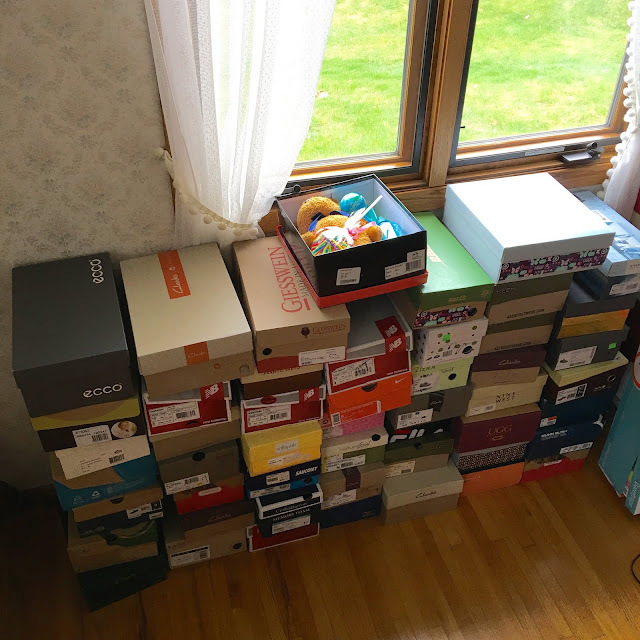 I have until the November shoebox collecting week to finish them all. I used a free pattern from Beyond The Reef found here: Teeny Simple Needle Cases For Friendship Group. Here's what the inside looks like. There will be several needles in each case, plus a spool of thread and charm squares in each box. And 50 shoeboxes for boys. The boys are getting the Mission Ball soccer balls. Those stuffed animals in the photo above are going in the girl's boxes. 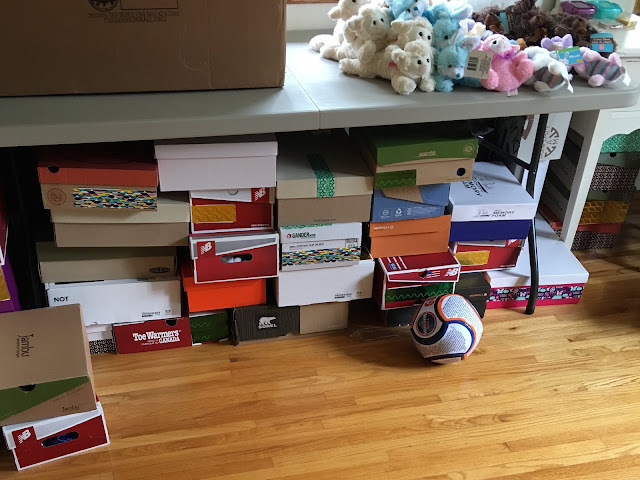 The boy's boxes have more masculine stuffed animals, thanks to Tracy! What would you do with 1,200 1 1/2" squares??? Linking to Confessions of a Fabric Addict, Busy Hands Quilts, Crazy Mom Quilts, Sew Can She, Quilting Is More Fun Than Housework, Love Laugh Quilt. I'd never thought of needle cases for the boxes. Great idea! Great scrap buster, and a wonderful project. I'll bet all the kids will be thrilled. A thoughtful gift, I wonder how many quilters of the future you will inspire. Beautiful needlecases, and a good project. 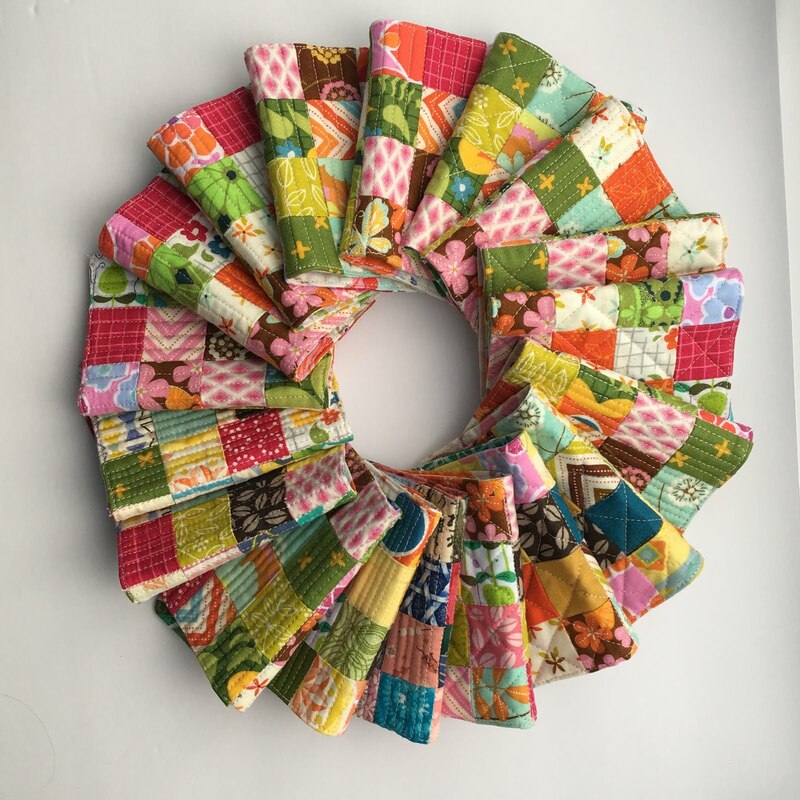 I love using scraps like this, too. That is an awesome idea. Thank you for sharing. Your needlecases are so pretty! Love your use of these tiny squares and that they are going to such a great cause. Great idea! And you find a home for all those small bits. Thanks for sharing with Oh Scrap! I don't know what I would do with all those squares, but what you did is wonderful. Those little cases look so sweet with those squares - I love the colors! OMG! What a wonderful project. They are darling and their girls will be thrilled with their boxes. Good for you! 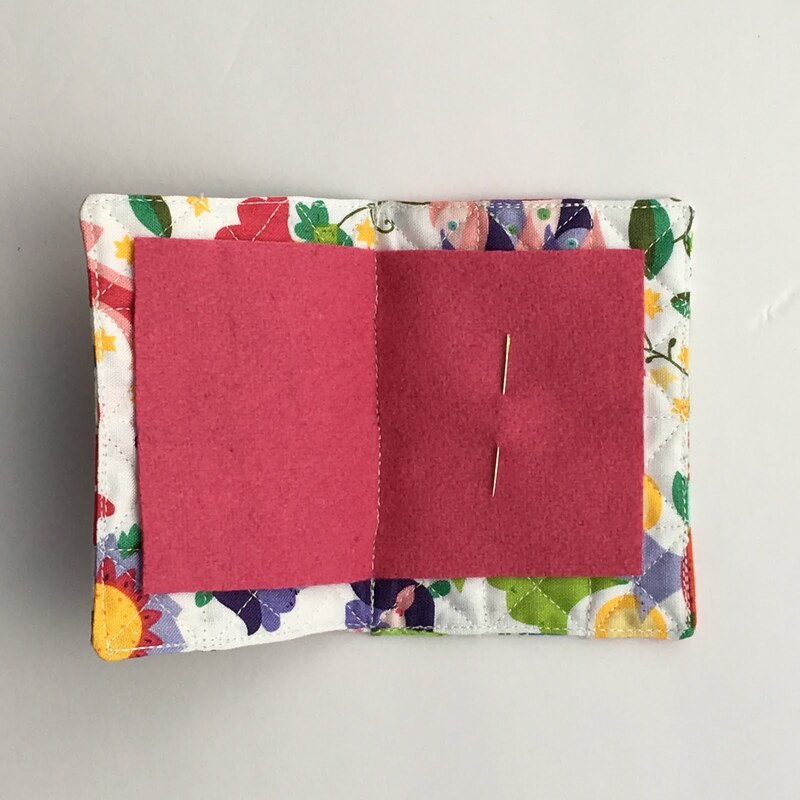 A wonderful cause and a great way to encourage girls to sew. Keep up the good work! What a blessing for so many children! The layout you show in the first picture-- on your counter -- would make a good quilt. (Squares and then wide strips of gray.) I think that's how I'd set them. What a great idea! You are so inspiring. So cute and useful. They will be greatly appreciated. Oh my, they're so pretty and so useful! I'm glad to hear you're making them for Operation Christmas Child, I really hope the kids who get this will feel the love that went into it! During this week's linky parties, I was determined to check out bloggers I hadn't seen before. Your blog is precious, your heart is golden and your generosity knows no bounds! Thank you so much for sharing! i have made a mini trips around the world quilt with them, 1,442 to be exact.